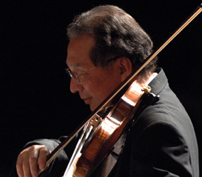 Yasushi Ogura is concertmaster of Symphony Napa Valley and Pocket Opera. He often performs for Broadway shows in San Francisco, acts as guest concertmaster with various regional orchestras such as California Symphony, Berkeley Symphony, Sacramento Symphony and more. He was also concertmaster/soloist with Diablo Ballet and for all productions of Zarzuela at the Jarvis Conservatory in Napa. He is frequently called to record film soundtracks at Skywalker Studios and other recording venues. Yasushi has been working as head coach of the Napa Valley Youth Symphony since its inception and is a tireless educator, teaching numerous private students as well.